...regardless of what the FBI report said (after being handcuffed by Trump), or that he lied under oath numerous times. It appears that a full confirmation vote will happen tomorrow. Short of a miraculous resistance from a few Republican senators, it looks like we're going to get the most politically biased Supreme Court judge in modern history. Anyone who listened to Kavanaugh rant about liberal Democrats and the "Clinton's," knows he's taken a completely inappropriate political stance which will carry over to the Supreme Court. Does that mean America has no choice now? Despite all of the favorable polls for Dr. Ford, and numerous organizations like The American Bar Association; or 48 Christian churches representing the bulk of Christians in America today; or the Catholic Ministries largest publication taking back their support for Kavanaugh; or the Mormon Church telling it's followers not to vote yes for him; is it a hopeless cause? The answer is no. There is one recourse. It may be a long shot. Impeachment. History shows it's happened before. An Associate Justice of the Supreme Court, Samuel Chase (in 1805), was impeached on grounds of letting his partisan leanings affect his court decisions. Sound familiar? 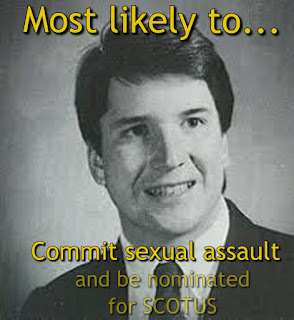 It's pretty much what analysts say Kavanaugh will do, after showing his true colors during the confirmation process. President Thomas Jefferson was alarmed at the seizure of power by the judiciary through the claim of exclusive judicial review by the Federalists (led by Chase) on the bench. The rest of the story; the Senate didn't accept any of the eight articles of impeachment (all bias related) because the majority was the opposition party. If the Democrats take back The House in the midterms, they could file for impeachment on the same grounds used against Chase, and add lying under oath. If the Republicans hold on to the Senate after the midterms, then the possibility of history repeating itself could happen and the effort will be squashed. Nineteen federal officials — including 15 judges and two presidents — have been impeached, but fewer than half have been removed by the Senate, because of the supermajority standard. Not likely, you say? Perhaps not. But it's a thought. Finally, as of today, no one knows for sure how the full vote will turn out. Some Republicans may find the courage to stop this farce and say no at the last moment.